We have a very small urban back yard that is mostly taken up with our vegetable garden. 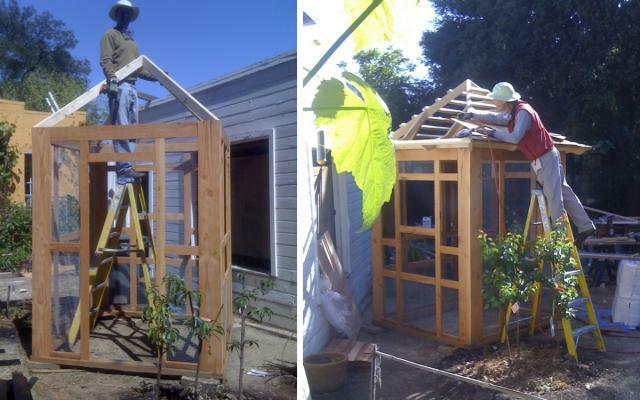 The challenge was to fit in a coop that was self contained and beautiful since the only place for it was on the edge of our patio. The preceding winter we planted three peaches in one hole and three apricots in another hole. These would eventually be in the chicken’s yard and would grow for shade. 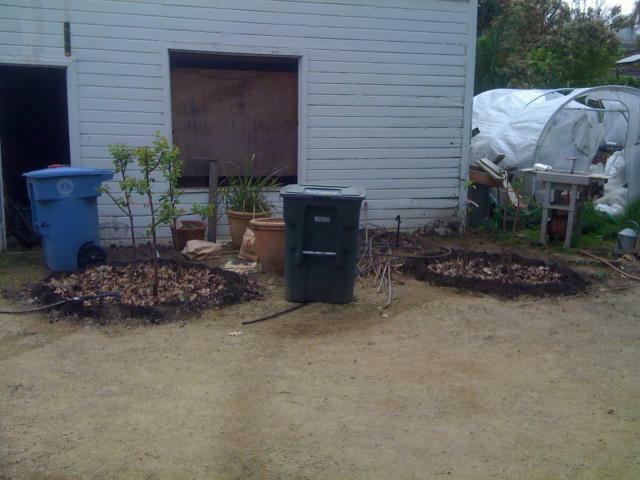 The future plan is to remodel the garage and green house behind the coop. The plan was made so that only one corner was close to the existing garage. That way when we do get to the garage remodel we are only working around one corner of the coop instead of a side. 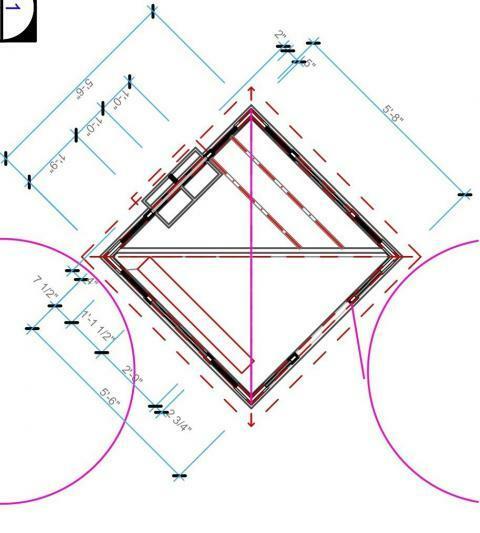 Th circles represent the fruit trees. 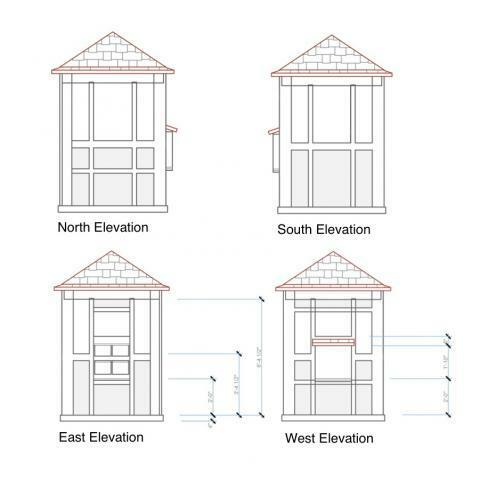 Here are the four elevations. 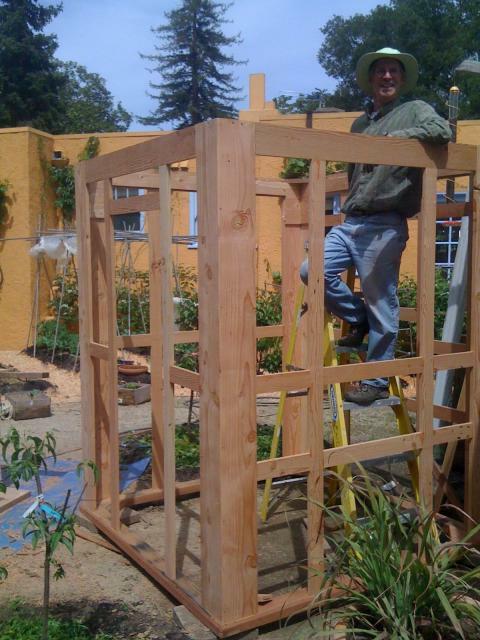 All of the framing for the wall uses recycled wood. We planed it all to give it a uniform look. The pieces are “biscuited” together to keep the frame thin and strong. 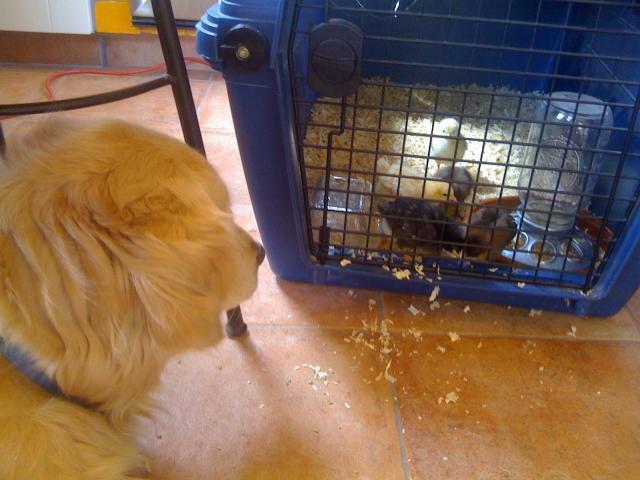 Meanwhile the chicks were being carefully watched over while waiting for the coop. 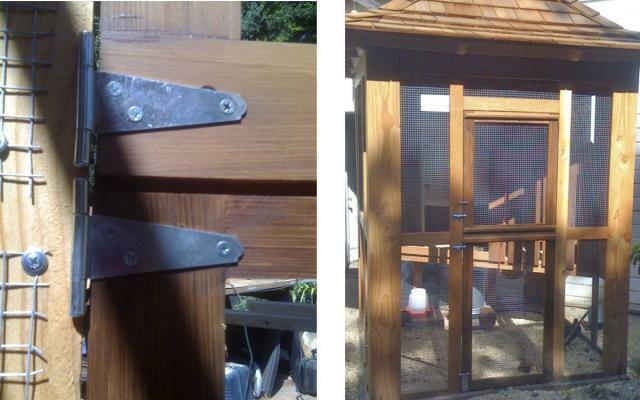 We attached hardware cloth to some of the openings and solid wood or plexiglass where we wanted to protect it from the weather. Also we put doors for cleaning out under the roosts. 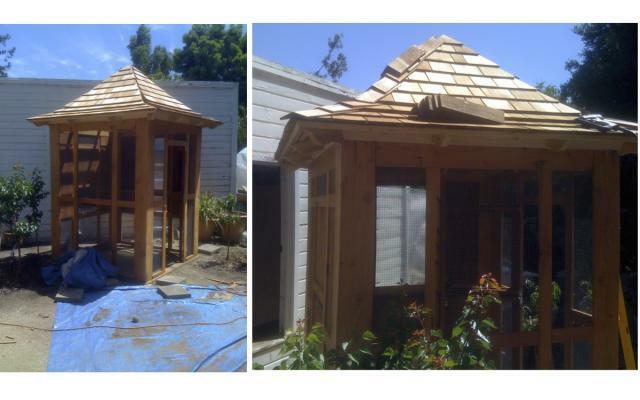 Next we did the roof framing and shingles. For the floor we laid concrete pavers that extended outside the coop to prevent critters from digging in. We also brought in an underground water line to hook up an automatic waterer. We built a diagonal floor with a ramp leading to it. The floor would have the nest boxes and the roosts. Under the floor (protected from chicken poop) we put a hopper type feeder an an automatic waterer. The nest boxes have a small storage cupboard above them. The top of it is slanted to keep the chickens from roosting on it. 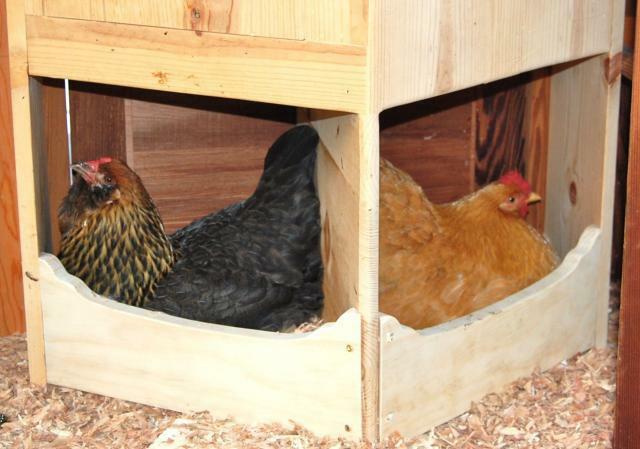 The roosting area has a small picket fence to give it more of a closed in feeling but allowing ventilation. The chickens won't roost on pickets. On the original plans we had the nest boxes sticking out. But with the new nest box design we were able to have the egg access door flush with the building for a cleaner look. 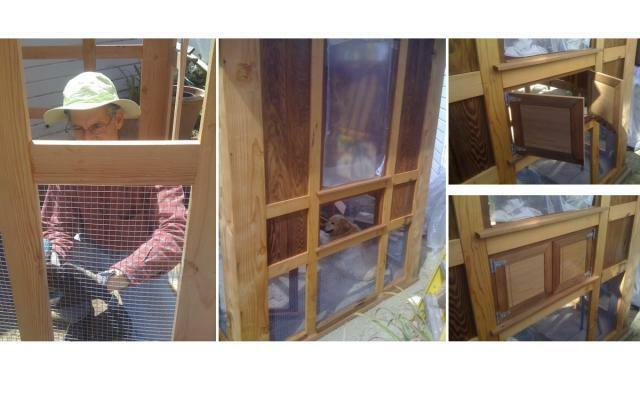 For the door we made a Dutch Door so that we could throw scratch or greens to the chickens without letting them out. We don't have a lot of room but wanted to make them a small run. We used "picket fence on a roll" to make the yard and gate. It wasn't quite high enough so we stuck a piece of thin bamboo next to every other picket. The bamboo is not visually intrusive but does keep the birds from flying over. Lastly we built a feeder that we sized to fit our sprouting trays. Each day the tray can just be dropped in and the chickens get fresh wheat sprouts all year round. 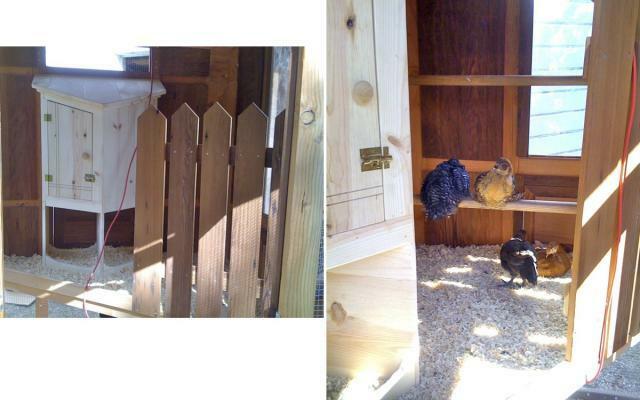 The thing that we still want to add/change is another small run on the other side of the coop that has a matching picket fence. We have planted that side with annual rye and will let the grass get about 3" high before we move the birds to that side. Then we will plant the rye on the other side and will be able to "rotate pastures". What a tidy coop! It fits nicely into your backyard. Very well built! 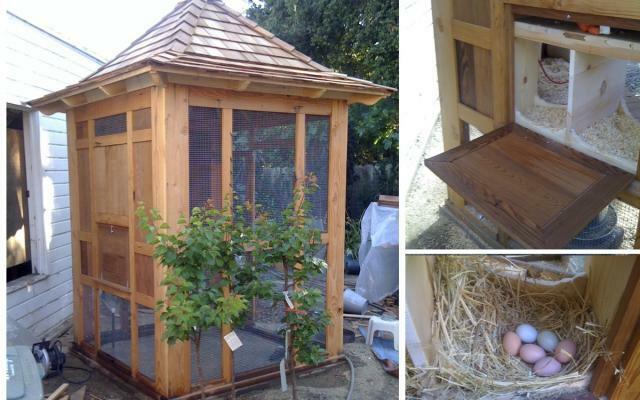 I wish I could build a coop like that, but with cold winters, it's not possible. Exquisite! Congratulations. How many chickens do you have? Love the nest box detail! Beautiful and functional! 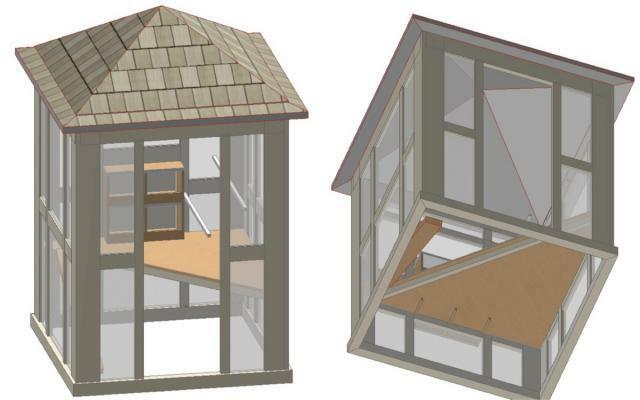 I am planning on replicating your incredible coop in our next home. Now that you've had it two years, what would you change about it? Are you happy with the open air aspect in your climate? Are you happy with the automatic waterer? Is it holding up well? Beautiful job!! 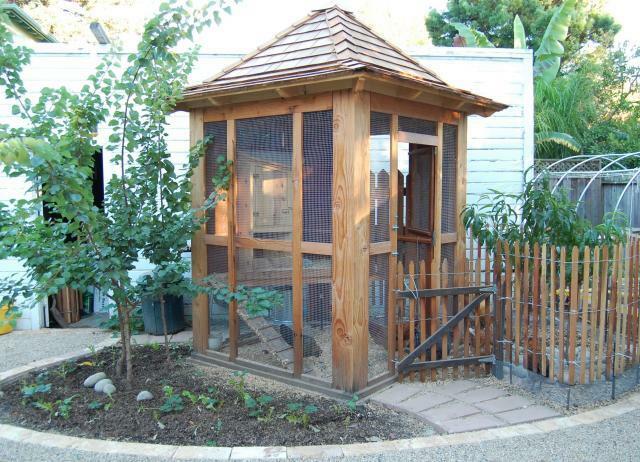 wish I could build our coop like that. Ohio is to cold in the winter though.